A few weeks ago, we told you what we thought of Sway, Microsoft's new Office app. Now you have a chance to try it out for yourself. Microsoft said Monday that the company has opened up the Sway Preview to any user with a Microsoft account, without needing to request an invitation. About 175,000 users have already requested to join, it said. There's even a mobile app—Sway for the iPhone although it's only available in Australia. 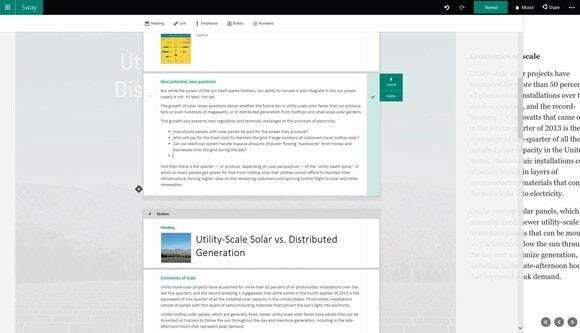 Microsoft's Sway sits somewhere in between Word, PowerPoint, and a Web editor, part of a new breed of blended apps that combine features from existing products. 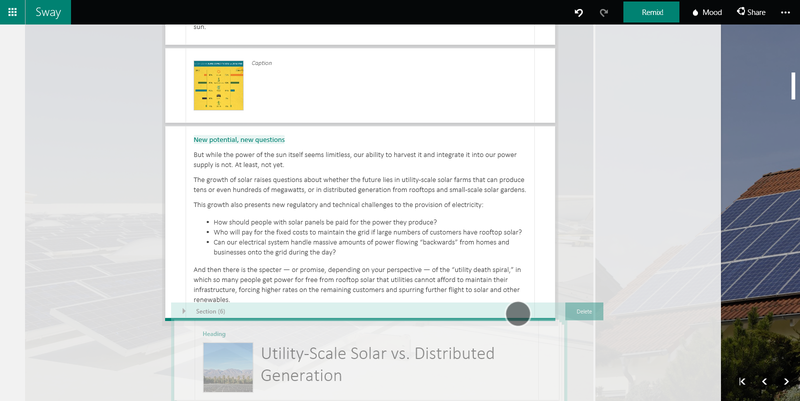 With Sway, users can quickly create documents that can be quickly supplemented with images and text, with Sway even providing input on design changes. With the upgraded Sway, users can easily rearrange blocks of text. Customers apparently complained, however, that Microsoft didn't go far enough, and a redesigned color picker is part of the new update. The Curated option will suggest more dramatic color choices, Microsoft said, and a small number of people will be shown a new feature which tints the background. Users will also receive more choices when they match colors with a given image. If there's anything Sway seems optimized to do, however, is to mix and match different forms of content. So far, Sway can embed pictures and documents, allowing users to rearrange them quickly. That's the basis of the additional upgrades; in a nice touch, you can build a Sway around a PDF, or just embed it in an existing document. Sections can now be grabbed with the mouse and reordered. And you can now type in Canvas mode, Sway's name for the WYSIWYG component of Sway. Microsoft added bullets and numbering, as well as an "Undo" and "Redo" button as well—even after Sway reformats or "remixes" the content. Why this matters: It will be interesting to watch Sway evolve, especially as Microsoft determines the boundaries between Sway and its other Office apps. Will Sway turn into a blank canvas for embedding music and movies? Could a Silverlight or HTML5 animation be added at a later date? So far, Sway is pretty basic—but that's the idea, too. Microsoft has an entire herd of features it can cull from Word and its other Office apps. But it probably needs to be careful and just focus on the cream of the crop.